Celtic monks were keen to find ‘thin places’ having the proximity of liminal awareness, where the elemental rock, water and air comprised no more than a permeable membrane, beyond which, is a living presence that is ultimately good. 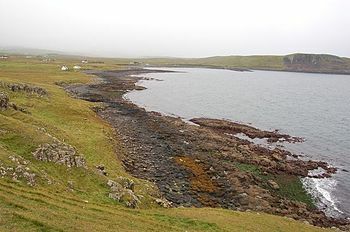 I was on retreat, a self-directed retreat, renting a National Trust for Scotland cottage called Beaton’s Croft, lying in the crofting township of Borneskitaig, about 6 miles north of Uig. Liminal is from limen, Latin for threshold – a place between places or a point of transition. I had come here because I felt that I had to leave behind a previous way of life and build a new structure. The details had not yet been settled. My motive in choosing Beaton’s Croft was somewhat more prosaic than the original monastic search for the spiritual liminality of the wilderness. It was a romanticised retreat influenced more by the novelty of the cottage. What I had not bargained for however was a new conversation with this place. 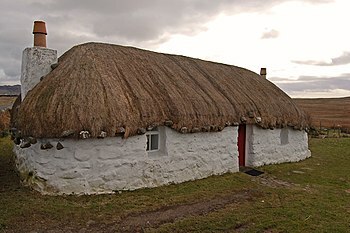 Borneskitaig is a thinly populated crofting community on the Trotternish peninsula at the extreme north-western tip of Skye and Beaton’s croft is a rare example of a thatched house that had been a family home until 1981. The NTS won an award for its conservation work when it took over the ‘A’-listed cottage in the 1990s and it is now a warm and comfortable holiday let with superb views across the Minch to the Isle of Harris. My life was in transition in the sense that I had surrendered responsibility for looking after my ancient mother (104 and counting) to a care home in my village, after what had been a very stressful period when her physical frailty and psychological problems had been increasing. The carer service had been excellent, even in the straightened circumstances of these austerity times, and my sister and her husband had been supportive, until that is, my brother-in-law became ill and died at the turn of the year. It was one morning after I had transferred my mother from the commode to her bed that she said, in a moment of grace, “This is not good for either of us.” Within a short time she was settled in the care home and I was thinking about some personal rest and recuperation. Easter is a quiet time for lay ministers, it’s when the clergy get stressed out, so I took my opportunity and booked the cottage. It was after I had banged my head on the door lintel and scraped the skin on the thatch for the nth time after arrival that I was beginning to doubt the wisdom of my decision. But the next day I sat out in the garden on the picnic bench with my mug of coffee planning my stay. The transcendental experience of the natural world encompasses wonder and awe and this location was blessed with far horizons to gaze on and sturdy hills to climb. There was also wall-to-wall sunshine which was to last the entirety of my week-long stay. Rejoicing in the resurrection of my solitary life, I sensed on the horizon a creative ‘edge’ of fragility and unknowing, raising thoughts about the Creator; the self-evident goodness of God hidden in what was the historical vestige of the original volcanic chaos. The malevolent tone of a hooded crow’s call as it listlessly patrolled the fields was unsettling, but the thin notes of the meadow pipit in the garden, “ist, ist, ist” were more confiding, whilst insisting I should listen attentively. The power of silence is an awesome experience. The birds’ cries eventually dissolved into the other side of nothingness. Time stood still. Only the soft breeze on my cheek, ruffling the flowers in the garden, gave any sense of movement. There was no other human presence. I closed my eyes and the world disappeared. My thoughts slowed down to a glacial pace as I slipped into contemplative prayer. The sacred word or phrase that I had been accustomed to using in this transitional phase of centring prayer served no useful purpose, as I opened myself to God’s presence, which was beyond all thought, image or emotion. Whereas previously ordinary thoughts would have intruded to interrupt the flow and thus require a re-centring of my attention, all that I sensed was a sinking into a deep peace of interior silence. Had I tried to capture the moment in my internal camera, in an attempt to possess what was happening, I would have lost it. The air that I was breathing was the presence of God.